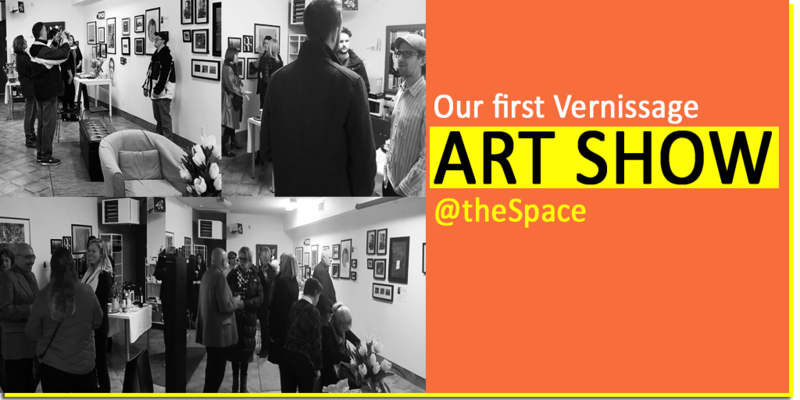 TheSpace always aims to highlight and reinforce the talent and value created by our hardworking members. Hosting our first public gallery was a great experience as our local community once again showed their incredible support. Several hundred dollars was raised and the majority of the work selected for displayed was sold in a single weekend. It was a great opportunity for friends, family and local community partners to see firsthand some of the work that came about during our many workshops. Many of our visitors remarked on the incredible range and the sophisticated nature of everyone's work. Pieces ranged from traditional illustrations enhanced using computers, programs and other technology to some pieces which showcased the possibilities of free open sourced software that enables anyone to create and collage a variety of mediums. For our team it was another oppurtinity to highlight our unique process and our goal of serving the adult population here in Ottawa. We all look forward to our next showcase as we connect with other organizations to host our member's work and find new ways to tell our stories, enhance identity and promote creative self-employment..
We've found a storefront that is central and accessible for our core members to easily attend. After much preparation, set up and coordination we are excited to host workshops and events that will help us meet our vision. Thanks to the overwhelming support of so many we are ready to help each adult individual find new ways for self-development as well as self-advocacy and promote life long-learning. With the support of everyone here in Ottawa as well as all across North America we not only reached our initial goal but raised over $30,000 in two months! Together, with everyone's support, we did it! Our small team, as well as parents, academics, and community partners understood Ottawa needed something like theSpace. We are honoured to put into practice our philosophy and understanding of a community center that aims to meet the needs of many adults here in Ottawa. theSpace will steward conditions to support the development of a welcoming community a safe third place of belonging.